Buttery, rich, vanilla thumbprint cookies rolled in salted, roasted macadamia nuts, filled with homemade, from-scratch key lime curd, and topped with a pinch of toasted coconut! 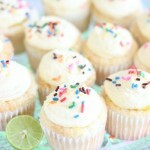 These Coconut Macadamia Key Lime Thumbprints are all the best flavors of spring and summer! 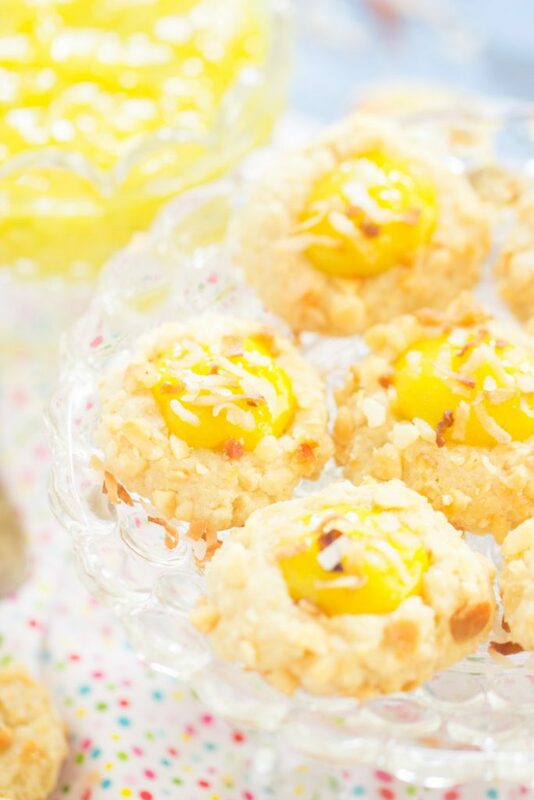 I feel really late to the game with posting spring recipes, but there’s a lot that will work for summer too, like these Coconut Macadamia Key Lime Thumbprints, so I guess it’s okay. With Easter over, I do not feel like spring is here, and I’m definitely not in a spring mindset. I know everyone is talking about how bonkers the weather was recently, so let me be one more annoying person to address it: what’s up with Mother Nature? I was visiting my family in Erie, PA, for Easter and it was FREEZING! It’s April and the temps weren’t even getting into the 40s. It was in the 30s most of the time, and it snowed for two of the days I was there. Post-Easter and it was snowing…. very weird. I didn’t love it, to be honest. I’m not in a spring mindset. Are you? I was more in a spring mindset in January and February when I was making all these spring things that will be coming up. Now I feel like it’s winter again! It felt like December up there! Also, I’m looking back on recent posts, and I like to try to vary things for you, but WOW, there’s a lot of pie. There’s this Lemon Chess Pie, Banana Pudding Peanut Butter Pie, Chocolate Irish Cream Pie, and Chocolate Creme de Menthe Pie. Need a pie? You’re covered. What about a cookie? 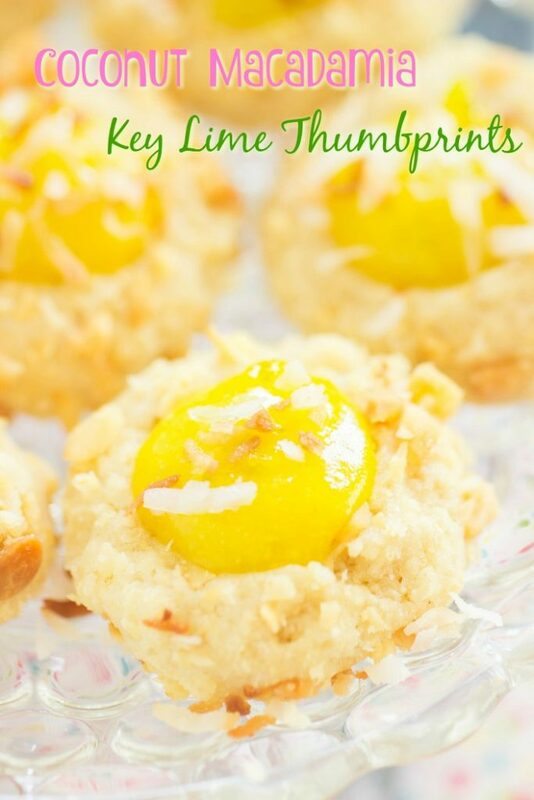 These Coconut Macadamia Key Lime Thumbprints will surely get you in the spirit of spring. 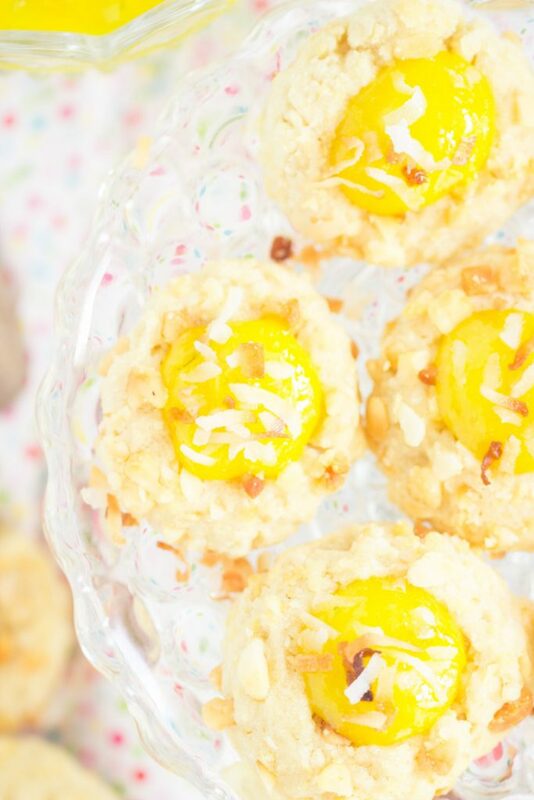 I have quite a few thumbprint cookie recipes on the blog, and they always perform well with you guys! I love a thumbprint cookie because you can cram a lot of flavors into them. 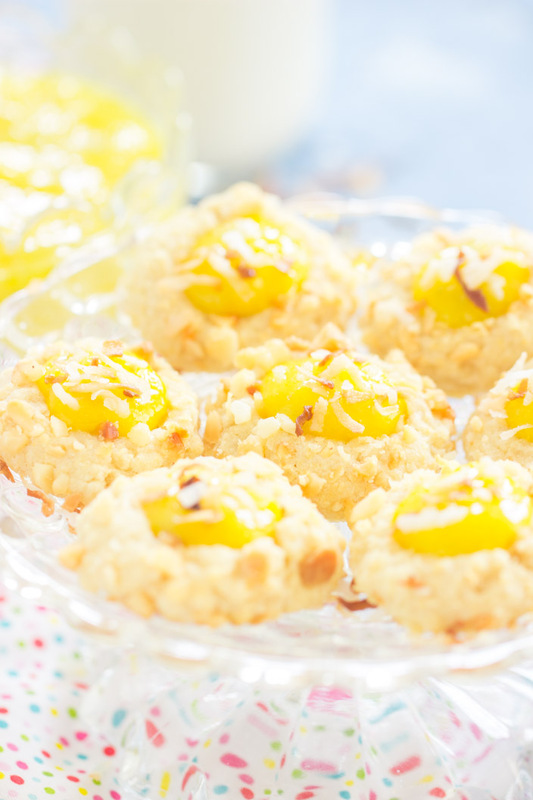 The cookie is one component, then the filling, then whatever you garnish them with – whether it’s a sprinkling and/or drizzling of something on top. 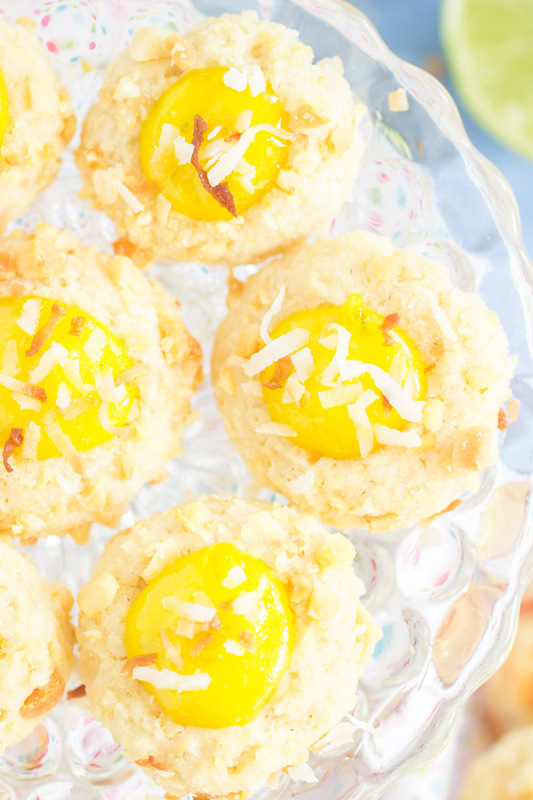 There’s a lot of directions to go with thumbprint cookies. These Coconut Macadamia Key Lime Thumbprints were partly born out of the need to use up egg yolks. 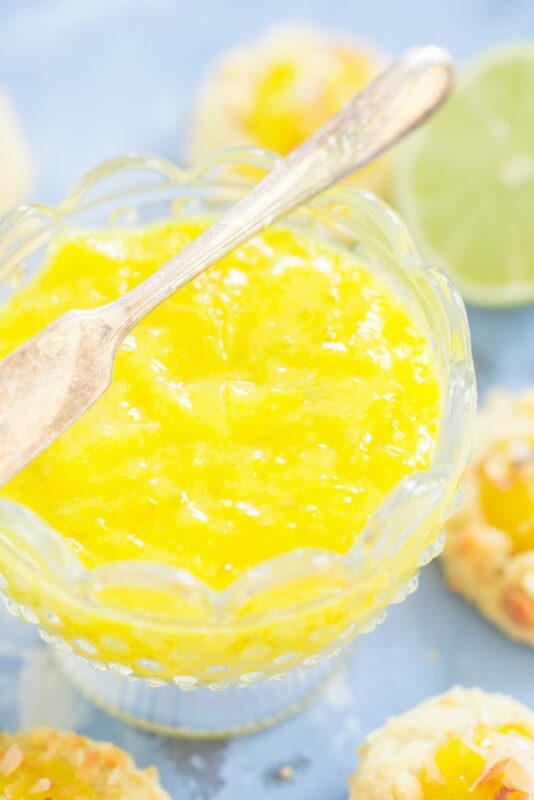 Whenever I have extra egg yolks, I make some kind of citrus curd. I whipped up a homemade key lime curd – this takes only a few minutes to cook + chill time. 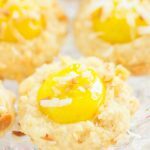 I used my vanilla shortbread thumbprint cookie base for these Coconut Macadamia Key Lime Thumbprints, it’s rich and buttery, and rolled them in chopped macadamia nuts. 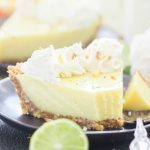 I filled these with key lime curd, and sprinkled a little toasted coconut on top to really hit home the tropical flavors! 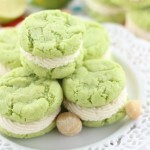 A cookie to get you in the mood for spring, to be sure! 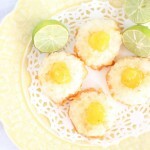 In a small bowl, whisk together egg yolks, key lime zest, key lime juice, and sugar. Transfer to a small saucepan. Cook the mixture, stirring frequently, over medium heat until it is thick enough to coat the back of a spoon, about 5-7 minutes. Stir frequently enough that you don't scramble the yolks! Transfer to a lidded jar or a small bowl. Cover and chill in the refrigerator while preparing the cookies. Beat in flour and salt until just combined. Roll each ball in chopped macadamia nuts to thoroughly coat. Arrange balls two inches apart on parchment paper or silicone mat-lined baking sheets. Bake at 375 degrees for 10-12 minutes, or until cookies appear set and edges are lightly browned. Spoon key lime curd into the center of each thumbprint. 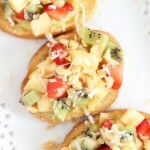 Sprinkle with toasted coconut, if desired. Other great thumbprint cookies to check out: these Chocolate Hazelnut Thumbprints with Kahlua Ganache, Chocolate Covered Strawberry Thumbprints, Peanut Butter & Jelly Thumbprints, Snickerdoodle Thumbprints with Cookie Butter Buttercream, and Dark Chocolate Peppermint Patty Thumbprints!